There’s a long list of successful businesses that started in a garage. If you’ve got an idea or business that you’d like to start, then you need dedicated space for an office. A garage is a perfect area for that. If you don’t want to feel boxed in, then you can always replace the garage door with a wall and windows. Whether you have one kid or five, the first thing that becomes apparent is that they have a way of taking over the entire house. You can reclaim your home by setting up the garage as their private playroom. There’s nothing wrong with keeping your washer and dryer in the garage but you can put down some linoleum flooring, add shelves and a kid size table to make this a terrific playroom. Won’t it be great to have all the toys in one place? If you are in to arts and crafts, then you need a good space for your creations. You can set of a central workstation in your garage and have plenty of overhead lighting. There’s also room for storage of all your materials. If your garage is freestanding, then you might want to consider adding a skylight to bring in natural light. Before you get to work on any of these renovations, you want to make sure your garage is completely clear of all your unwanted clutter. One call to Junk King Contra Costa gets that job done. These professional junk haulers will be able to literally back right up to your garage door. All you have to do is point to the things you want taken away and you’ll be amazed at how quickly they disappear. 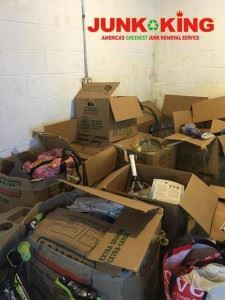 Make your garage into something wonderful by clearing out the clutter first with help from Junk King Contra Costa. This entry was posted in Contra Costa Junk Removal and tagged clutter, garage, Junk King Contra Costa, junk removal, rubbish on July 24, 2017 by Junk King. Last updated July 24, 2017 .